Decision making is a funny thing. Most of the time when you make a decision it is not long lasting or life altering. Although it may seem like it at the moment, choosing where you go to college does not dictate your future! If things aren't working out you can always transfer or change direction. Now that I have hopefully put you a little bit more at ease (I know this is a stressful time...), you should think very seriously about where you decide to go to school. Everyone has different criteria and places more importance on certain aspects of schooling. I'm going to share with you what went in to my decision process, what I wish I had done differently, and give you suggestions for making the process as easy as possible! Your friends should not be a major influence on you. My best friend and I share everything and are always asking for each other's opinions. When it comes to choosing a school it is extremely important to make the choice that is right for you. You are looking for a place that will further your professional and intellectual ambition, so use your preferences to guide you. Don't be married to rankings. It is so so so easy to get caught up in rankings and wanting to go to a school because of the perceived prestige. Yes it is true that these rankings have value, but ultimately when you get into the workforce you will be evaluated on the skills you have developed and the evidence you can present that you are a good candidate rather than the ranking of your school. If you are going to look at rankings, one I recommend is the SMI (check out my post about this method of ranking here). Take everything you hear with a grain of salt. 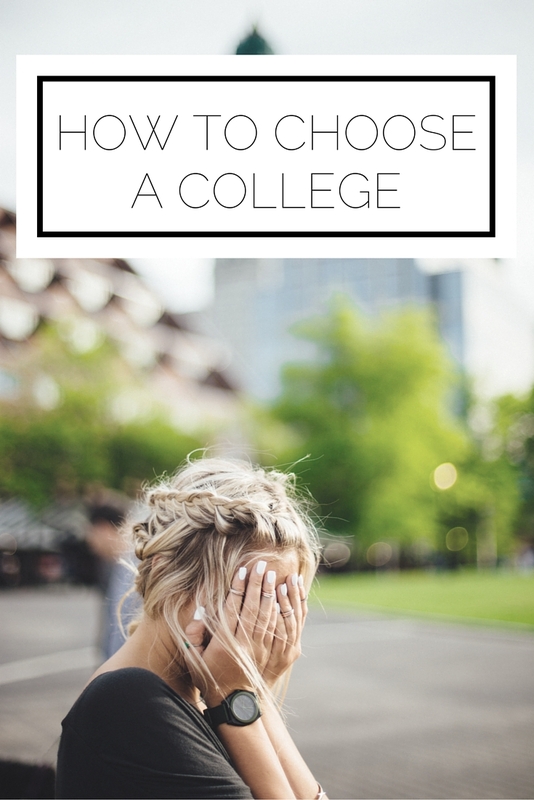 When all you and your friends, and your family, and your teachers, and your mailman are talking about is college it can be easy to be swayed all different ways as you hear a variety of advice. Much of it can be valid, just be sure to remember who the source is and do your own research. All of these criteria were guiding points for me as I picked which schools to apply to. I did apply to some bigger schools and non-Catholic schools even though it did not quite fit all of my criteria, but because it excelled in one area or another. Once the acceptances came in, it was easy to eliminate based on price. If there was not enough scholarship I couldn't go. Everyone will have that one thing which will help them narrow down the choices. For you it might be the feel of the campus when you go to visit or perhaps it will be that you realize the distance from home is too much (or perhaps too little haha). I eliminated The College of New Jersey initially because it did not meet the Catholic requirement. I was really just looking for any way I could to narrow down the list. I so wish that I had taken the time to fully investigate the school and realize that what was most important, like a strong business school and proximity to home, was what made TCNJ the best. I came to see that growing in my faith was something I could do, through the Catholic Campus Ministry, without being in a Catholic school. Looking back, I wish that I had been more open minded and given TCNJ a chance from the starting gate. My dream school was sitting right in front of me, but in my haste to narrow down I discounted it. So what should you do to avoid a mistake like mine? Realize there is more than one way to meet your requirements. For me, I had to realize that my faith journey did not need to be furthered by my school, but rather that if I sought the resources it would actually be a better way to grow. Don't just focus on looks. We all (well maybe not all, but most of us) want to go to a picturesque school with ivy covered buildings straight out of the movies. Or perhaps modern buildings are more your style. Whatever you may be looking for aesthetic-wise, remember it's what's on the inside that counts. You may think to yourself, "I won't be happy if I have to be on an ugly campus" but just trust me when I say that yes, although it will contribute to the experience, it should not be one of your top concerns. Have realistic expectations. When visiting schools, I did not expect the freshmen dorm rooms to be as tiny and outdated as they were. But at some point you need to realize that this is reality and where it is important, like with alumni networks and academic rigor, you can demand the best. When it comes to accommodations or food, you may just have to accept it. Finally after dragging out the process longer then I needed to, I decided to come to TCNJ and I could not be happier with my decision. The game changing moment for me was when I truly looked into the academics, realized I would be foolish not to attend the top business school in the state, and talked with the dean of the school. Funny story there: I emailed the dean of the business school, not realizing what a big deal that was, and asked him if he would sit down with me to talk about making this decision. The fact that he took the time to meet with a prospective student when he has an ENTIRE SCHOOL TO RUN just shows how much attention TCNJ gives to undergrad students. Hopefully you have an aha moment like this, or something that shows you that this school is the place for you. You don't need to expect that in your college search, but there should be something that stands out to you about the school you choose. So now that I've told you all about what went on for me, let's go over the steps you should take to make the process as painless as possible. Develop your criteria list. You will have, of course, had requirements which led you to apply to the school. Now is the time to refine it and have your very top priorities ironed out. Ranking your requirements will make it easier to evaluate your schools. Eliminate the schools that you know aren't going to work. This can be very hard when it's your dream school and something like money may be the issue, but it will be better to let go of something you know you can't have early on so you can more quickly put your attention on the viable options. Visit or re-visit the top schools. Going to the top contenders with your priorities in mind and asking questions to clear up any areas you are unsure about can be hugely beneficial. Ask for the opinions of people who matter. Your parents and guidance counselor can aid you in weeding out the schools which are surely great, but aren't the best for you. Make a pros and cons list. Once you are able to narrow it down to two schools, it's time to whip out your pen and paper and make a list. Weigh out the benefits and drawbacks of the two schools to see where they stand. And drum roll please...make your choice! Once you have all the information you need to make an informed decision, send in that deposit baby because you're going to college! How are you making your college decision? If you are already in school, what was the most important thing to you when you were choosing? For more college posts click here! I just found your blog and for sure I will visit your blog often. Inspiring post. In October I am going to college and I have a few things to sort out in my head. Thank you Klaudia! Congratulations on going to college in October; that's very exciting! What will you be studying?